← Apathy and Ethos: Exploring Creative Ways To Promote Care For Creation. There will be twin "morning stars" in the eastern predawn sky for the next several days; Venus will appear very near the star Spica for the next week. Conjunction of Venus and the star Spica in the predawn sky, Nov. 13, 2018. Credit: Stellarium / Bob Trembley. Conjunction of Venus and the star Spica in the predawn sky, Nov. 19, 2018. Credit: Stellarium / Bob Trembley. A waxing crescent Moon joins Saturn in the southwestern sky on Nov. 13th. The Moon and Saturn in the southwestern sky shortly after sunset on Nov. 13, 2018. Credit: Stellarium / Bob Trembley. In the south, Mars joins that same waxing crescent Moon on Nov. 13th. Mars and the Moon in the southern sky shortly after sunset on Nov. 13, 2018. Credit: Stellarium / Bob Trembley. Conjunction of Mars and the Moon in the southern sky shortly after sunset on Nov. 15, 2018. Credit: Stellarium / Bob Trembley. 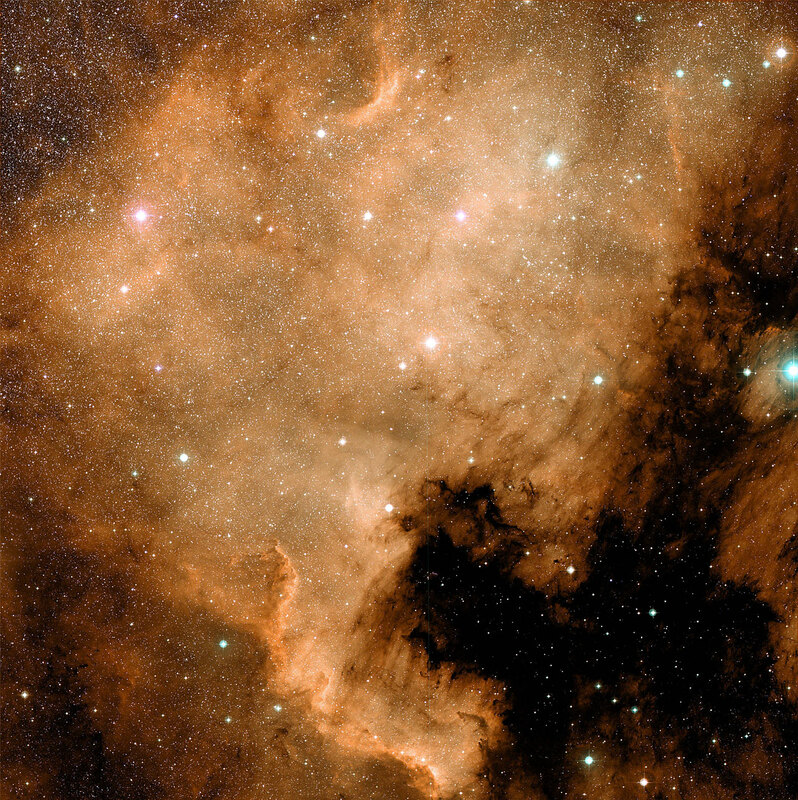 The North America Nebula is an emission nebula in the constellation Cygnus; the shape of the nebula resembles that of the continent of North America. The nebula covers an area more than four times the size of the Moon, but has low surface brightness, and cannot typically be seen with the unaided eye. Location of NGC 7000 - The North America Nebula in the constellation Cygnus. Credit: Stellarium / Bob Trembley. This image layout reveals how the appearance of the North America nebula can change dramatically using different combinations of visible and infrared observations from the Digitized Sky Survey and NASA's Spitzer Space Telescope, respectively. In this progression, the visible-light view (upper left) shows a striking similarity to the North American continent. The image highlights the eastern seaboard and Gulf of Mexico regions. The red region to the right is known as the "Pelican nebula," after its resemblance in visible light to a pelican. The view at upper right includes both visible and infrared observations. The hot gas comprising the North America continent and the Pelican now takes on a vivid blue hue, while red colors display the infrared light. Inky black dust features start to glow in the infrared view. In the bottom two images, only infrared light from Spitzer is shown -- data from the infrared array camera is on the left, and data from both the infrared array camera and the multiband imaging photometer, which sees longer wavelengths, is on the right. These pictures look different in part because infrared light can penetrate dust whereas visible light cannot. Dusty, dark clouds in the visible image become transparent in Spitzer's view. In addition, Spitzer's infrared detectors pick up the glow of dusty cocoons enveloping baby stars. Comet Machholz-Fujikawa-Iwamoto (C/2018 V1) was discovered last week by three amateur astronomers! This week, look for the comet near the conjunction of Venus and Spica. Position of Comet C/2018 V1 Machholz-Fujikawa-Iwamoto, Nov. 13, 2018 Credit: Stellarium / Bob Trembley. This week is excellent for lunar observations! The Moon is a waxing crescent in the southweatern sky at dusk, and is heading towards first quarter on Nov. 16th; after the 16th, the Moon will be a waxing gibbous visible in the southern skies after sunset. The Moon from Nov. 13-19, 2018. Visualizations by Ernie Wright. The sun has a wee spot... so small, it can only be seen in hi-rez images. In the animation below, the location of the spot is visible as the bright region of coronal loop activity near the equator. The months-old northern coronal hole remains open, and a small southern hole has reopened. SpaceWeather.com says "Earth is exiting a stream of solar wind that ignited an explosion of almost-mythical auroras over the Arctic Circle on Nov. 10th and 11th. Another stream of solar wind is coming. Estimated time of arrival: Nov. 18th. Stay tuned." The solar wind speed is 471.2 km/sec, with a density of 4.3 protons/cm3. Near-Earth objects (NEOs) discovered this month: 122, this year: 1744, all time: 19142. On Nov. 12, 2018, the NASA All Sky Fireball Network reported 19 fireballs. Position of the planets in the inner solar system, Nov. 13, 2018. Credit: NASA Eyes on the Solar System / Bob Trembley. InSight and MarCOs approaching Mars - Nov. 13 2018. Credit: NASA Eyes on the Solar System / Bob Trembley.